Is there a part of your mouth that throbs with a lot of pain, even when you aren’t eating or speaking? 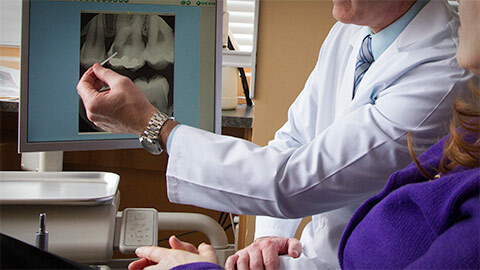 You may be experiencing an infection in the pulp inside your tooth and may require a highly specialized kind of dentistry called Endodontics, or root canal treatment. . Endodontics takes care of the pulp and biological materials that are inside your teeth. The space inside the hard layers of enamel is known as the root canal system and is filled with soft dental pulp made of nerves and blood vessels. An abscessed tooth, or a tooth with a cavity, could spread infection into the pulp, which can be very painful and cause a great deal of discomfort. It is important that you get this kind of infection treated right away to prevent more serious dental health problems. Root Canal is the process of removing the infected or dead pulp from your tooth, replacing it with a root canal filling. We are highly skilled and will perform a root canal treatment painlessly, in most cases in one visit.